A green shield bug (Palomena prasina) in Budapest, Hungary. 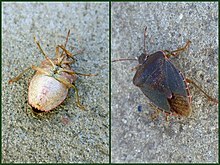 It is an insect of the order Hemiptera, and so is one of the "true bugs". Middle English budde (“beetle”), from Old English budda (see scearnbudda (“dung beetle”)), from Proto-Germanic *buddô, *buzdô (compare Low German Budde (“louse, grub”), Norwegian budda (“newborn domestic animal”)). More at bud. The term is used to refer to technical errors and problems at least as early as the 19th century, predating the commonly known story of a moth being caught in a computer. (colloquial, US) Any insect, arachnid, myriapod or entognath. (entomology) An insect of the order Hemiptera (the "true bugs"). (colloquial) Any insect, arachnid, or other terrestrial arthropod that is a pest. Any of various species of marine or freshwater crustaceans; e.g. a Morton Bay bug, mudbug. (chiefly computing) A problem that needs fixing. I have the right principle and am on the right track, but time, hard work and some good luck are necessary too. It has been just so in all of my inventions. The first step is an intuition, and comes with a burst, then difficulties arise -- this thing gives out and [it is] then that "Bugs" -- as such little faults and difficulties are called -- show themselves and months of intense watching, study and labor are requisite before commercial success or failure is certainly reached. I think he’s a gold bug: he has over 10,000 ounces in storage. I caught the skiing bug while staying in the Alps. (informal) A keen enthusiast or hobbyist. Incidentally, the camera manufacturers have had a new worry—that they might "kill off the hobby," as U.S. Camera magazine put it recently—by automating to the point that real camera bugs would feel no challenge. A small and and usually invisible file (traditionally a single-pixel image) on a World Wide Web page, primarily used to track users. Channel 4's bug distracted Jim from his favorite show. (aviation) A manually positioned marker in flight instruments. At this point your telegraph operator, sitting at your right, goes "Ticky-tick-tickety-de-tick-tick," with his bug, as he calls his transmitter, and looks at you expectantly. As far as the dashes are concerned, the bug is the same in operation as any regular key would be if it were turned up on edge instead of sitting flat on the desk. I was a very good radio operator. I bought my own bug. That's what the telegraph key in its modern form was called. It was semiautomatic. Sir, spare your threats: / The bug which you would fright me with I seek. (chiefly LGBT, "the bug") HIV. (poker) A limited form of wild card in some variants of poker. We asked Harris if he had any recommendations about seeing the famous trilobite digs. He said we should just drive out to his claim in the Wheeler Quadrangle, and it was just fine with him if we dug a few bugs. Now, only three years later, most of the major oil companies maintain staffs of these men who examine cores, classify the various types of "bugs," or foraminifera, and make charts showing the depths at which each of the hundreds of types is found. (slang, horse-racing) A young apprentice jockey. Adjectives often applied to "bug": major, minor, serious, critical, nasty, annoying, important, strange, stupid, flying, silly. (transitive) To install an electronic listening device or devices in. 1987, Alfred W. Tobler, Dicionário Crioulo Karipúna/Português Português/Crioulo Karípúna, Summer Institute of Linguistics, page 5.